Still a relatively new treatment, most patients aren’t familiar with the Teeth-in-a-Day process. This unique dental implant supported tooth replacement method may be the ideal solution for many patients, but only a select few dentists offer this unique tooth replacement method. If you’ve experienced advanced tooth loss, we invite you to keep reading to learn more about the Teeth-in-a-Day process and whether or not it is the best treatment option to fully repair your smile. Don’t hesitate to consult with a local dentist or oral surgeon, if you would like to find out more. Even a single missing tooth can adversely affect a patient’s oral and overall health. Without one tooth, the surrounding teeth shift out of their alignment to fill the gap in the smile. The underlying supportive alveolar bone and gum tissue are not stimulated, so this structure diminishes, leading to further tooth loss. Additionally, without the healthy, natural gum and bone tissue to support and shape the face, you’ll notice sagging and wrinkling around the mouth. These adverse effects are more apparent for patients with advanced tooth loss, so it’s important to replace teeth immediately to maintain optimal oral health. Traditional implant supported dentures function by placing four to six dental implant posts along the jawline to support the prosthetic. Rather than spreading dental implants across the jawbone, the Teeth-in-a-Day method uses three specially crafted dental implants positioned into the front of the jaw to support the whole denture. One dental implant is placed vertically into the front of the jaw to support the front part of the denture. Then, two implants, one on each side, are positioned diagonally from the back of the denture into the dense area of the jawbone at the front of the mouth. In most cases, a temporary denture is placed on the same day that implants are positioned. You will likely need to have a second denture crafted and placed once the jaw has healed. If you’re in need of advanced tooth replacement in San Antonio, it’s time to call the New Image Dentistry team. We offer a wide range of tooth replacement solutions to meet your unique needs. From traditional, removable partial and full dentures to full mouth reconstruction using dental implant supported prosthetics, we have an option that will work for you. Don’t put off replacing missing teeth for one more day. 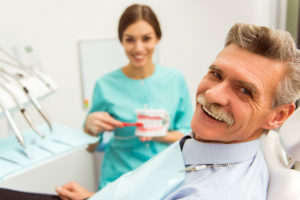 Visit the San Antonio dentist and team at New Image Dentistry to renew your smile today. Comments Off on What is Teeth-in-a-Day?